The Washington Post (3/19/18) thinks the question is thorny, so it makes sure to prune the answers. 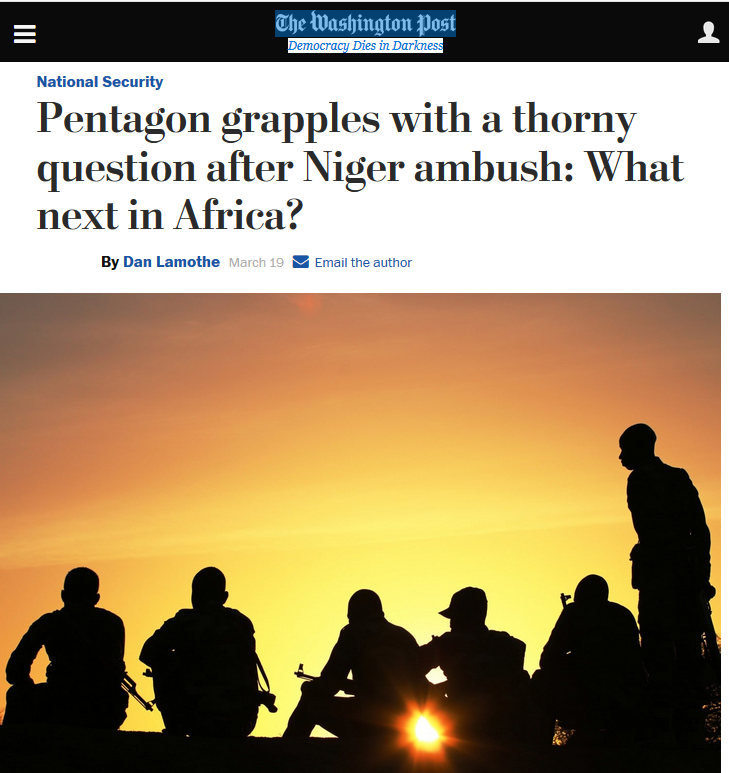 While the question of US military intervention in Africa is one that deserves deep interrogation and investigation by journalists, the Post approaches it by assuming the benevolence of America’s aims on the continent, and fails to question the strategic value of endless war. The goal is not to prevent US casualties—and, more importantly, the devastation inevitably wreaked by the most powerful military in the world—by, for example, withdrawing US forces from the continent. For the Washington Post, US military presence in Africa is assumed—not challenged or questioned in any meaningful way. “Sometimes, the knee-jerk reaction when something bad happens of, ‘Get them out of there,’ that’s not a particularly good response,” he said. What’s wrong with that response? The Post doesn’t ask. I think American citizens should rightfully ask, “How do we define this mission set?”?Is it building up indigenous forces, and is that the extent of it? If so, great. Or are we doing kill-capture missions? Because if we’re doing kill-capture missions, the horror of war is that you’ll always kill the wrong guy in some numbers. The Post doesn’t follow up on the questions Goepner raises about how the US will intervene militarily in Africa. But left completely out of the discussion is anyone who thinks the US military shouldn’t be intervening in Africa at all. That ensures that the answer to “what next in Africa?” will always involve endless war. Messages can be sent to the Washington Post at letters@washpost.com, or via Twitter@washingtonpost. Please remember that respectful communication is the most effective.